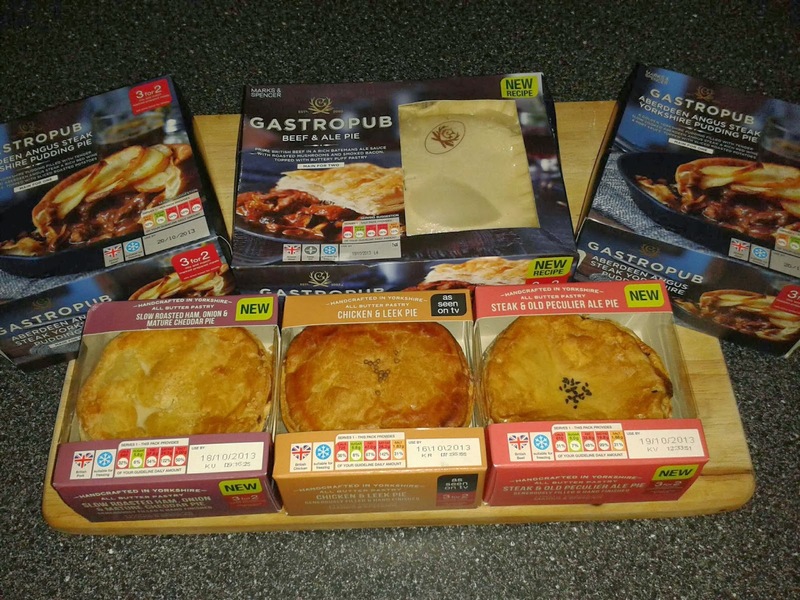 Pierate - Pie Reviews: Have Marks and Spencer got the Pie Factor?! Now before you say anything about the picture, I'm sure you've spotted the anomaly in the photo. Sure, all the food items called themselves pies on the boxes... but really, are they really all pies? We'll get to that later! So are you sitting comfortably and ready for the first ever Pie Factor?! What's your name and where are you from? I'm the Gastro Pub Beef And Ale Pie from Marks and Spencer. And what do you do? I sit in the Gastro Pub chilled cabinet, hoping people want a pub-like meal without heading to the pub. And what do you think you can offer us tonight? 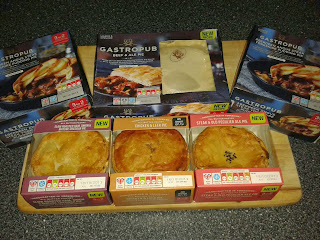 Well, I'm a top crust pastry pie, covering tender chunks of beef alongside rich ale gravy, roasted mushrooms and smoked bacon. Oh... well don’t get me wrong... I mean the buttery puff pastry was delicious but... just a top crust? That's right... no side and base pastry with me. But the colour of my pastry is very golden - more golden than you find on the box! That's very true! The filling is very good to be fair to you - though with no sides and base I can't really comment on your capacity! Point taken. But the content that is there is good, right? It is. The beef is very tender - I've got to give you that - and you did have a nice ale flavour through the gravy. However there were very negligible pieces of bacon in your act, which is disappointing when you name them on the front of the box as a main ingredient. 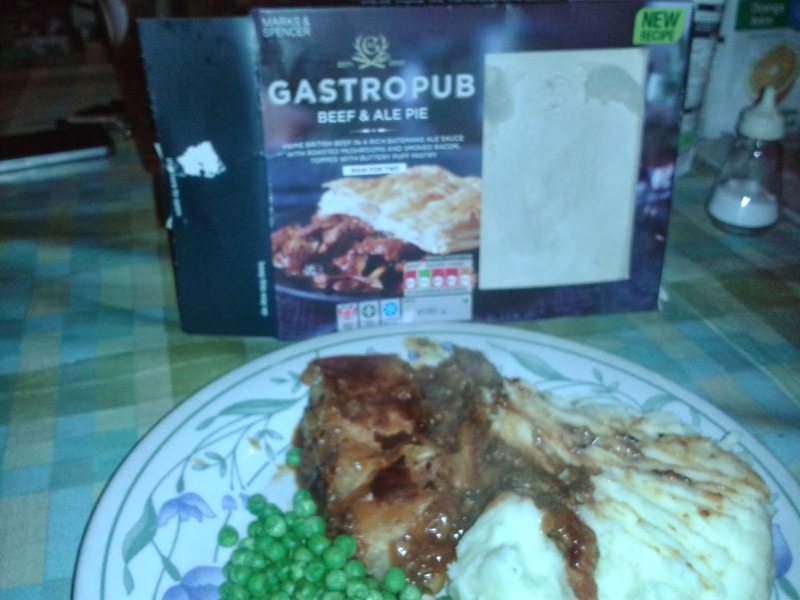 I've got to dock you marks for being a top crust, I'm sorry to say, and at £6.99 as a meal for two you don’t score that well for cheapness. But the good news is – with a score of 5.4/7 - you're through to the next round! Congratulations! What's your name and where are you from? 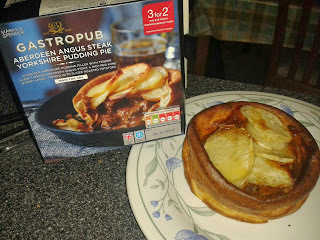 I'm the Gastro Pub Aberdeen Angus Steak Yorkshire Pudding Pie from Marks and Spencer. And what do you think you can offer us tonight? Well I'm a Yorkshire pudding filled with nice tasty steak and topped with a shallow layer of sliced roast potatoes.